Launching Event to mark that Visa Application Processing Services for Schengen Visas to Greece in Beijing, P.R. of China, are being handled by the new Service Provider, “Global Visa Center World” (GVCW). Thursday 7th June 2018, Launcing Event to mark that Visa Application Processing Services for Schengen Visas to Greece in Beijing, P.R. of China, are being held by the new Service Provider "Global Visa Center World (GVCW)". 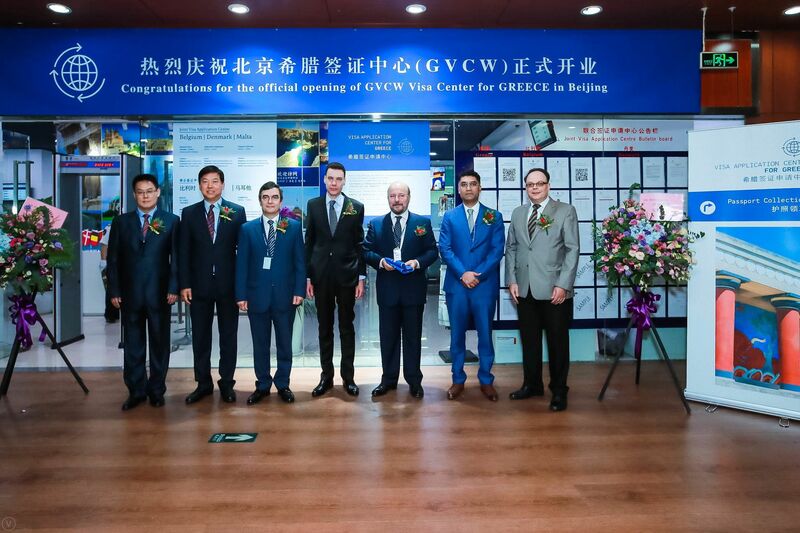 President of GVCW, Eleftherios Oikonomou, VP Dimitris Platis and Consul Mr. Anastasios Kezas cut the ribbon at VAC for Greece in Beijing, accompanied by representatives of local partners. The inauguration event followed a beautiful reception at the Embassy of Greece in Beijing hosted by H.E. the Ambassador of Greece to P.R. of China Mr. Leonidas Rokanas. (from right to left) H.E. the Ambassador Leonidas Rokanas, the President of GVCW Eleftherios Oikonomou, the Head of Consular Section of the Greek Embassy Anastasios Kezas, VP & CEO of GVCW Dimitris Platis. © 2018 Global Visa Center World. All Rights Reserved.